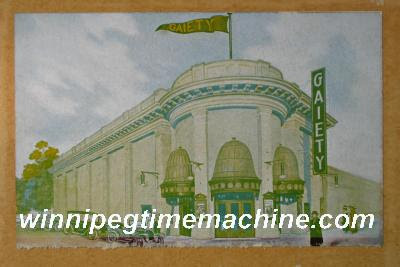 At one time Winnipeg had as many as 130 theatres. The Capitol opened in 1921 and was designed by New York architect Thomas Lamb. Lamb did all of Famous Players Theatres. He also designed Madison Square Gardens and many of Toronto’s Theatres. It was unique in that it was a two part structure. It had its entry and marquee on Portage Ave where Le Chateau is today. But because land was too expensive to put the theatre on Portage, it was built on Donald with a connecting tunnel on the second level over the back lane. It had an extravagant entry with a marble staircase. In 1979 the Capitol was remodelled and became two theatres by being cut into two at the balcony level. The Met closed in 1987, the Capitol in 1990. An American-based conglomerate, Famous Players took away the Allen’s distribution deal for Paramount pictures signing an 18 year deal. Understandably, the Allens got into financial trouble, and in 1922 and were bought out by competitor Famous Players in 1923 for a tiny fraction of what their theatres were worth. By 1930, Famous Players controlled 207 of Canada’s 229 chain theatres. The Capitol was the Allen’s main competitor. It had 2,200 seats and a similar arrangement with balcony and elaborate plaster detailing. One entered from Portage Avenue up until 1963 or 1964. After purchasing tickets one would walk up a flight of marble stairs and marble finished walls. There were silk tapestries, mirrors and heavy brass railings to guide the theatre goer up and over that tunnel to the theatre itself. Children remember seeing Pollyanna at the Capitol just before its Portage Avenue entrance was abandoned and remember the experience of that grand entry which seemed so rich and opulent like the interiors in movie itself.